Excellent workouts, Limited Space, and Quick Assembly are just three of the features offered by the newest Powerline Home Gym, the BSG10! You don’t need an engineering degree to put the BSG10 together. The gym comes 90% pre-assembled in one box. All of the high impact resistant nylon pulleys and 2200lb tensile strength steel cables have been hung and strung by the factory. No confusing diagrams to follow during this assembly. It’s a simple 9 bolt process. You can be working out in as little as 30 minutes. The compact frame, less than 4 foot wide and 6 ½ foot tall let you install this gym anywhere. Engineered to be compact and easily assembled, the BSG10 does not compromise your workouts. A stable platform and multiple seat adjustments let the BSG10 accommodate many users of all sizes. A 160lb. 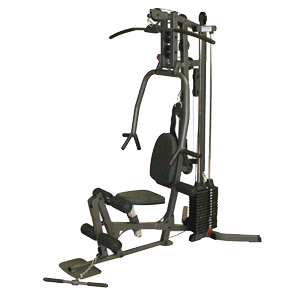 adjustable weight stack, high, mid and low pulleys, 8 position adjustable press arm and leg developer station; the BSG10 enables the user to perform over 40 exercises, safely and biomechanically correct. Included with the BSG10X is a 48″ lat bar a low row bar and an abdominal-harness.